Essex legends EDDIE & THE HOT RODS recently announced that 2018 would be their final year of touring. 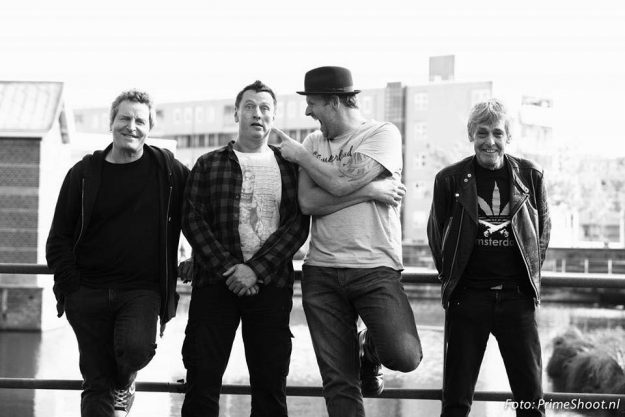 Ahead of the band’s show next week at Northampton’s Roadmender club, Vive Le Rock‘s Peter Dennis caught up with the band’s drummer Simon Bowley for a chat…. Peter: Hi. Please introduce yourself and the band. Simon: My name is Simon, I manage the band and play drums. Dipster plays bass, Rich plays guitar and Barrie Masters is the original vocalist. Peter: Can you tell me about your musical journey? What was your earliest memory and what made you want to pick up an instrument? Simon: My uncle is Steve Nicol who along with Barrie formed the band in 1975. Steve was the original drummer so my earliest memory is of them being played on the stereo and watching them on TV. I was 7 when I went to the Rainbow to watch them. I started playing drums properly at the age of 8 or 9. At the age of 13 I joined a show band and did some TV work. All through school I played in different youth bands. When I left school I formed a heavy rock band called Enigma, we were managed by my uncle and we signed to Virgin Records but unfortunately nothing happened. At the age of 26 I joined Eddie and the Hot Rods and 21 years later I’ve toured all over the world, played some of the biggest festivals and had a right good time. Peter: What other bands were you in before the Hot Rods? How did you join the Hot Rods and how do you feel the new line up gels together? Simon: I joined the Hot Rods as a stand-in for the guy they had at the time, the band were just doing odd shows and not taking it too seriously. I eventually got the job full-time when the band were offered a 76 date tour with Dr. Feelgood. Peter: That whole Canvey Island scene was magical with a host of great bands. How does that whole scene compare now with then? Simon: Dr. Feelgood kick started the whole Canvey Island scene and the music press latched onto it, a bit like the Madchester scene with Oasis. These days there are still good bands coming from the Island but unfortunately they’re stifled by the music press. Peter: ‘Teenage Depression’ is often cited as the link between pub rock and punk rock. How do you feel about the albums legacy? Do you consider the band to be a pub or punk rock band? Neither? Or something in between? Simon: I feel the album does have a place in history as the link between pub and punk rock. It was recorded in just a week and sounds raw and energetic. The Hot Rods were a rock band who likened themselves to bands like The MC5. They never got into the whole punk look and never liked the punk tag. Even today we are a high energy rock band with a punk twist. Peter: You attract a wide demographic to your shows. How does it feel to see young people who weren’t even born in 1977 digging your music? Simon: It’s great. They often come up to us and say, “My dad told me I must come and see you and I’m so glad I did.” It’s nice that we can still connect with the younger generation. Peter: You recently toured with John Otway. What was it like touring with such an energetic performer? Were you worried that he might upstage you or did that spur you on? Simon: It’s funny because John is actually a quiet, sensible chap off stage. No we never feel upstaged and we never go out to upstage anybody either. We appreciate that people have spent their hard earned cash coming to watch us and just try to give them a great show. We have known John for a long time and his show is very different from ours. It’s all great fun. Peter: You’ve gigged all over the world. Where was your best reception? How to over seas crowds compare with the UK? Any new territories you’d like to play? Simon: I think I would have to say that the USA is the best, purely because we still appeal to a younger audience over there, they are pretty crazy gigs. Foreign audiences are good. I think they appreciate that we still travel to their countries. The UK audiences are still great too. I would’ve liked to play Australia before we stop but that’s looking unlikely now as 2018 is our final farewell. We don’t generally mind who our touring partners are. I think these days the package tours of bands from the same era do very well. Peter: The band haven’t played Northampton for a while. How do you feel that this tour is going to hit the town? Simon: I remember visiting Northampton and The Roadmender on the Naughty Rhythms Tour back in 2000. Strange really because that one went on the ‘must visit again soon’ list. Is it 18 years already?! It was a great gig and venue. The people were really friendly and up for the gig, so were really looking forward to playing there again. ‹ LOUDER THAN WAR – SCOTLAND SPECIAL!